Magdalena Moriche began her journey in the Extremadura Parents Association for Integration in Badajoz, before even opening the doors of the organisation, especially in her role as mother, without any knowledge of associative approach or finding resources. In 1995 the first meetings of parents affected by disabilities were held, where Magdalena always had a very active role and fought for the disability to have an official diagnosis. Three years later the Association was legally established. In 2003 the “Magdalena Moriche” Foundation was created, named after the mothers and fathers who made up the Association, in order to recognise the work of Magdalena of all these years. Currently the Extremadura Parents Association for Integration in Badajoz is a social entity that goes way back and with more than fifty people employed, which works every day to include and normalise a disability of people with borderline or light intelligence. Ángel Barrera Nieto is an entrepreneur from Extremadura with an extensive business career. Founder of Adiper Servicios de Atención a la persona (Adiper Personal Attention Services) in 2004 and president of the Extremadura Dependency Care Association- AESAD. Adiper is a project that focuses on providing a better quality of life for the elderly, providing support and telecare services, in addition to measures to reconcile the work and family life; health care services and caretaker services among others. It currently has 135 employees and since 2012 it is present in the Chilean market. María de los Ángeles Plata is an entrepreneur with over twenty years of experience at the helm of the family business “Ecolimpieza”, a general services company that was founded in 1993 and has a workforce of more than 900 workers. With presence in Spain and Portugal, the company works to provide quality services to suit the demand of its users, enabling cost savings and allowing each customer to focus on their core business. It should be noted that Maria de los Ángeles is an ambassador of great strength in the relationship between customers and employees. She has collaborated with the Down Syndrome Association for years, and was one of the first companies to create jobs for this group. She has been recognised, among other awards, with the Premio Empresaria de Badajoz (Badajoz Entrepreneur Award) in 2013, and was included in the “500 women who make Extremadura” list by the newspaper Periódico Extremadura. Holding a Law degree by the University of Extremadura, Esther Sánchez was imbued by the wine-making tradition of her family and has spent 18 years at the helm of the Catalina Arroyo wineries. This winery of Ribera del Guadiana dating back to 1920 has adapted to the times. Characterised by the quality of its wines, it has managed to find a balance and maintain its oenological root for more than 90 years, while being a pioneer in producing signature wines with the varieties Cabernet Sauvignon, Merlot and Pinot Noir in Extremadura. Manuel and Pedro Álvarez. Heral Enología S.L. Manuel Álvarez has a degree in Chemistry and Oenology by the University of Extremadura and is an expert in Industrial Microbiology Biotechnology (University of Seville). On the other hand, Pedro Álvarez Rangel is a technician in the production of wines and other alcoholic beverages, in addition to expert in viticulture, oenology and marketing of wine. Both have developed their professional experience in wineries and wine industries. In 2002 they created the company Heral Enología to offer technical oenology advice to wineries and companies of the sector in Extremadura, to later manufacture and market “tailored” products and oenological additives for Extremadura wineries. Heral Enología currently provides comprehensive services to wineries in operations such as field control, ripening control, production, ageing, bottling, wine control and analysis … And it also markets oenological products, both theirs and those of the major manufacturers of the sector. Significantly, it is the only yeast factory in liquid and active format for oenological use nationwide, and has a laboratory for the analysis of food products authorised by the Regional Government of Extremadura. 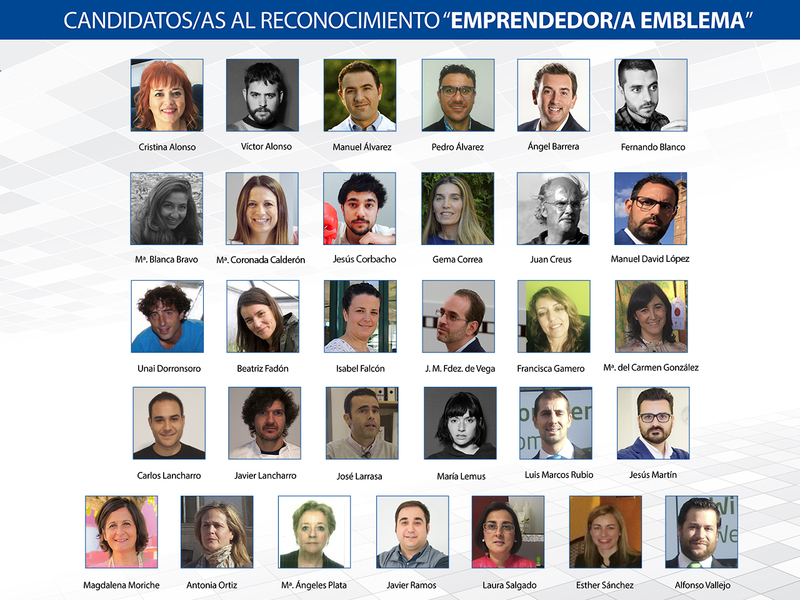 Due to their work, they have received several awards such as the CTAEX Award granted to the Extremadura Innovative Entrepreneur in 2005; the Neex Award to the Best Extremadura Innovative Project in 2007, and was a finalist in the Entrepreneur XXI Award in 2008. Antonia Ortiz is an entrepreneur in the wine sector, which together with her husband, Diego Nieto García, has spent years making significant investments in products and infrastructure to convert the Romale wineries in a leading company in its sector. It was founded in 1989 and is in Almendralejo, being one of the first wineries that make up the Designation of Origin (DO) Rivera del Guadiana. They currently produce wine and cava, and they also have an enotourism proposal based on visits to the wine cellars and wine tastings. In 2006 its wines entered the DO Cava. Notably they received the Gran Espiga de Oro (Great Golden Spike) of Extremadura Cavas. María Blanca Bravo is the founding partner of the Natural Lycopene Cosmetics. Pioneering company engaged in the production of 100% natural cosmetics made with lycopene, a natural pigment considered as the red gold of Extremadura, which is extracted directly from tomatoes and has antioxidant properties that make it a very outstanding product for health and beauty. They currently sell through e-commerce, el Corte Inglés and Carrefour. Internationally they sell in Chile. Laura Salgado Sereno is an entrepreneur who comes from an entrepreneurial family. Over 100 years ago, her grandmother began with a small tobacco shop in Mata de Alcántara where she gradually introduced other services and products, until the business reached Laura’s hands, who specialises in nutrition and opened an online shop as a showcase for local produce that she ships nationally and to countries like Slovakia, France, Germany and Belgium among others. La Tienda de Extremadura was launched in 2008 and has allowed the opening up of Extremadura traditional products to the world, giving them prominence on the Internet and online sales, for which she received the Premio nacional Autónomo del año III Premios Cepyme (National Autonomous Year III, Cepyme Award) 2016. Javier Ramos is an electrical engineer, PhD by the University of Extremadura and founding partner of BioBee Technologies, where he currently holds the post of executive director, with more than 4 years of experience in managing technology-based companies and in the development, implementation and justification of R & D + i projects of a business nature. BioBee Technologies is a company that specialises in designing miniaturised low-cost solutions for the electric characterisation of biological materials, which are extremely useful in the fields of health, food industry, veterinary and civil engineering. The company is built around a group of electronic engineers and software developers with experience in designing low-consumption analogue and mixed integrated circuits, and in the development of wireless communication systems. Although to date BioBee Technologies has no offices outside Spain, its products are used in the US, Belgium, UK, Ireland and Canada. Law degree by ICADE and specialised in Financial and Economic Management, Cristina Alonso represents an affordable and real model of Extremadura entrepreneur and of the possibilities that Extremadura has to offer. She is passionate about the business world in which she has been developing her activity for more than 20 years working in different businesses and managing teams. With entrepreneurial genetics, in 2013 she created Empresas en Positivo through which she has collaborated with more than 50 companies and entrepreneurs to whom she has provided advise, she has supported and helped, operating as an external financial management department. Cristina is a strong advocate for the visibility of women entrepreneurs. She is a member of the International Council of Experts of Womenalia, conducts online consulting, writes articles for Tribuna del Experto and is part of the Extremadura Mentors’ Network. Francisca Gamero began her business career in 2008. With an entrepreneurial spirit and previous experience in a couple of local projects, she went from being a housewife to developing and patenting an innovative and novel product worldwide for the correction of protruding ears, in a simple, comfortable, high quality and affordable fashion. At the beginning of the project she had to train intensively in the field of Business Management and Administration, taking courses and seminars in different areas of business knowledge and ICTs. Innovaciones Disras S.L. focuses its activity, after several years of research and development in collaboration with the University of Extremadura, on the manufacture and distribution of Otostick, a product created to correct protruding ears without surgery. In 2013 the Otostick Bebé product was launched to the market. The company is currently positioned internationally and sells in more than 15 countries. Unai Dorronsoro has a degree in Marine Sciences, a training that allowed him to gain knowledge about the cultivation of spirulina. Spirulina is a superfood that provides more digestible proteins than those found in beef, and contains a surprising variety of nutrients: vitamins, minerals, essential fatty acids, proteins, nucleic acids (DNA and RNA), chlorophyll, and a wide range of phytochemicals. After receiving training on cultivation by experts from France and Chile, Dorronsoro started his first entrepreneurial experience; he implemented an artisanal farming plant growing spirulina. Koru Spirulina is an artisanal farming plant which can be found in nature in the heart of the Sierra de Gata (Acebo) and is environmentally friendly. Focus is placed on the production and marketing of this microalgae in an innovative presentation. Fernando Blanco. Push Company S.L. He began in arts, but his passion led him to switch to science and studied technical architecture. After working in a few companies, in 2016 he decided to launch his own company. Push Company is a young company with distinct development possibilities that offers temporary architecture services through structures and adaptation of spaces, thereby opening an innovative range of new possibilities in the field of construction and infrastructure. Finalist in the Premio Espiga Mundo Rural (Rural World Spike Award) in December 2016. María Lemus and Víctor Alonso. Maria&Fisher, S.L. María Lemus is a 34-year-old entrepreneur who studied at the European Institute of Design – IED, and who along with her partner Víctor Alonso created her own fashion company. Maria & Fisher S.L. was founded in 2009 to fill a niche in the growing fashion market, based on innovation and using old techniques such as crochet and other Extremadura traditional arts, blending luxury, quality and avant-garde. Her models have paraded on catwalks such as Cibeles and New York. Miley Cyrus, Katy Perry, Puff Daddy, Lady Gaga, among others … wear her clothes with handcrafted details handwoven in Extremadura. Juan Creus is a lawyer, consultant and entrepreneur. Owner and partner at Estudio Jurídico Castellana in Madrid, he specialises in company law and corporate finance. In addition, from 1998 to 2010, he has prepared and conducted training courses for the financial system. He has been speaker at more than 200 courses on qualitative risk analysis for corporate banking, having among its main customers Banco Santander, Banesto and Ibercaja. As for his professional side, his participation as a promoting partner in technological projects such as Wafers, Centesil or Parque Solar Paramo may be highlighted. In 2012 he created the company Biostevera S.L. with a clear vocation for innovation, engaged in the cultivation of stevia under the seals of organic and biodynamic agriculture, its conditioning (dried leaf) and international marketing. Within few years of operation, he crossed our borders with great effort, offering a differentiated quality product in demanding markets such as Germany. His plantation was certified as ecological by the Regional Government of Extremadura, and it received the international certification of biodynamic agriculture by Demeter. Carlos and Javier Lancharro are brothers and partners in the restoration project Honky Tonk. Javier studied cooking at the renowned School of Taberna de Alabarderos of Seville and trained at prestigious restaurants such as Avantar, only Michelin star in Seville. Meanwhile, Carlos studied Business Management and Administration and has experience in the sector. Honky Tonk is a catering establishment located in Monesterio, which began its journey in May 2015, and is characterised by offering tapas made with local, fresh, organic and seasonal quality products, good service at a reasonable price and by having a wide variety of Extremadura wines. José Larrasa is European Doctor of Veterinary Science, expert in molecular biology and infectious diseases with 15 years of experience in research. He developed his scientific career at the Infectious Diseases Unit at the Faculty of Veterinary Medicine, University of Extremadura, participating in national and international projects. He has completed research stays in Edinburgh, where he conducted his specialisation in animal and bacterial genomics. After his experience in 2002, he launched Laboratorios Dr. Larrasa, S.L.U. An initiative conceived as a laboratory for veterinary clinical diagnosis, for the preparation of auto-vaccines for veterinary use and food analysis, evolving in 2007 to a High Security Biological Laboratory. Being the first company in Extremadura in achieving an SME instrument and leading in biotechnology, developing among other services, proprietary technology in genomic analysis such as results of R & D+i processes, centring point on genetic variations applicable to animal species of economic interest, which has enabled the development of DNA biochips for the predictive valuation of certain production characters (fertility, growth rate …) aimed at a genetic improvement assisted by molecular marker, without genetic modification. He has entered contracts to provide services for genetic selection with agri-food multinationals from Brazil. María Coronada. Atención a la dependencia extremeña, S.L.U. María Coronada, aged 28, and five years after obtaining her physiotherapist title, three of which she worked in the Rehabilitation department of a home for the elderly of Villafranca de los Barros, she decided to launch her company called Atención a la dependencia extremeña SLU. A company created in 2009 that transcends mere physiotherapy services. It is a Home Health Service Centre that provides physiotherapy, occupational therapy, speech therapy, therapeutic pedagogy, psychology, diet and nutrition services. Furthermore, it provides home assistance, with SEPAD and privately, throughout the region and currently has a team of 160 highly qualified professionals. Jesús Corbacho. Eureka, Medicina y Cirugía, S.L. Destiny wanted Jesús Corbacho, after completing the pre-enrolment in more than twenty faculties, to be a doctor, and gave him a tremendous opportunity to be part of the pioneering project in higher education on problem-based learning, which was established in the Degree in Medicine syllabus for the first time in 2008 at the University of Gerona. After 6 years of university studies and experience, Jesús makes the decision that will lead him to become a “Gamechanger”. He did not specialise in anything in his degree in medicine; he decided to become an entrepreneur. Jesus shaped a project to help change society and steer the ship of social innovation and progress in health: Surgical planning with 3D printing. Manuel David studied technical vocational studies in Electrotechnical Equipment and Installations and Automatic Regulation and Control Systems. Later he graduated as Technical Industrial Electrical Engineer and Industrial Engineering at the University of Extremadura and as Mechanical Engineer in Denmark. It was at the Danish University where he began work on bioenergy aspects, acquiring a strong “know how” in biogas and biomethanation plants. As for his professional experience in the engineering field, his work at companies like Deutz Diter in Zafra, or the Seville multinational of renewable energy Ingenostrum, may be outlined. After his professional expertise as employed, in 2014 he decided to start his own enterprise in Extremadura creating the company GRUPO IZAVI, specialising in bioenergy projects, waste processing and waste management using sustainable techniques. His collaborations carried out in different research projects with regional research centres such as CICYTEX, and national centres such as IRTA are noteworthy. At international level, he works with companies from Northern Europe specialising in bioenergy reaching a strong synergy for business success. Luis Marco Rubio and Alfonso Vallejo are two cousins who are also two entrepreneurs aged 29 who drew together their business future while living their Erasmus experience in Germany. The idea came in 2009 in Freising, a small German town where the world’s oldest brewery can be found. They learned the art of brewing and its traditional applications and four years later they were starting their dream. On 15 June 2013, the Cerex Beer was created. A company based in Zarza de Granadilla, engaged in making and selling craft beer that used traditional products of Extremadura in its preparation, such as cherries or acorn, to achieve a different quality product. In just three years they have managed to cross our borders and export to countries like Peru, China, Switzerland, Holland, Belgium, Mexico and Singapore. Cervex has received many awards including the noteworthy Mejor Cerveza Artesana de España (Best Craft Beer in Spain) 2015, the golden stars of the Superior Taste Award 2014/2015 and 2016; the Extremadura Exporta Award 2016, or the Premio a la Promoción y Desarrollo Turístico Comarcal (Award for Regional Tourism Promotion and Development) of Trasierra-Tierras de Granadilla.